We have a few hip mobility sequences, and will share a few over the next few days. This post will discuss one of our favorite strap assisted sequences that we learned from Hot Asana’s Long Slow Deep (LSD), courtesy of Casey Backus. We are still working some tweaks for our 3rd trimester mamas for the outer thigh part of the sequence, but generally this sequence can be done by prenatal and postpartum mamas. During pregnancy, if you begin to feel light-headed or dizzy during any of the postures on your back, please roll to your side and rest for a few moments. Most of these positions can be flipped over, or done at an incline! You may want to take a break off your back between each posture during the sequence, but it is up to how you are feeling! The mobility of the hips and pelvis are so important for helping with balance in the uterus. The balance of the uterus helps with fetal positioning, and restrictions could result in the malpositioning of the fetus. While there are numerous reasons we could have restrictions or imbalance, there are some solutions that may help. These could include mobility work, chiropractic care, and intentional movement. Placing a strap or band around the ball of your foot, pull the lifted leg upright. Lifted leg can be straight or slightly bent. Play around with the two until you find that sweet spot. The grounded leg can be bent or straight; it’s really personal preference. Pull the lifted leg towards your head, without straining in the shoulders or neck. Hold for 30 seconds to 3 minutes. Allow the leg to fall open. Option to bring the opposite leg in as a counter balance. You can also keep the leg straight out. Again, focus on keeping the shoulders and neck relaxed, as you pull the leg towards your head. Keeping both hips on the ground, move the lifted leg slightly to the opposite side. You should feel a stretch in the outer thigh/glute. Now allow the leg to fall over to the opposite side. The more you straighten the leg, the more intense the stretch will be. The more you bend it, the less intense. Experiment with both to find your sweet spot. Option to place a yoga block or pillow under the stretching leg for support. We are still developing an option for this for our third trimester mamas, as the belly tends to impede the path of the leg. More to follow. Release the strap. 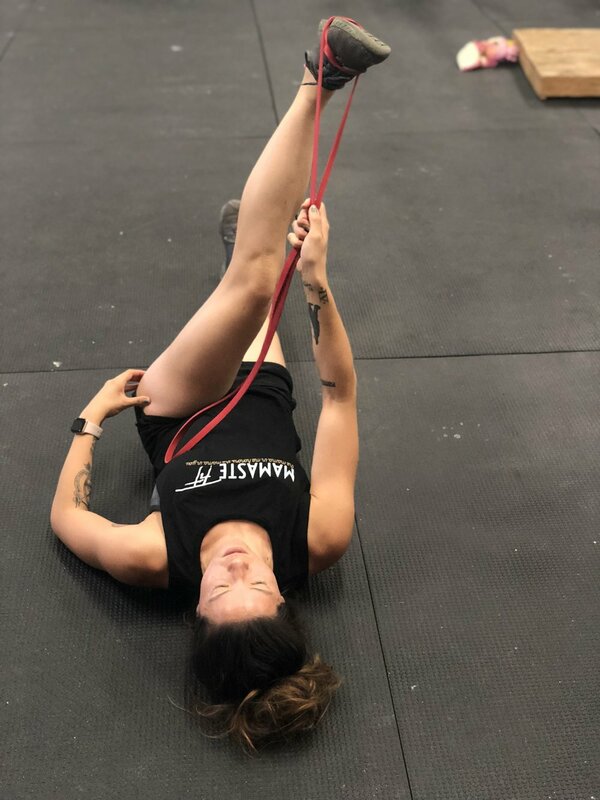 Bring the ankle over the knee and pull straight downward. If this is not accessible, utilizing a strap may be helpful. Another option would be lizard lunge, as shown in this image. You can use a stability ball for support, or place the hands/elbows on the ground as you can. Remember to keep the chest lifted, and avoid the desire to round in the upper back. Now, bring the foot towards the face for a form of half pigeon on your back. Option to utilize a wall or flip over and do a more traditional pigeon. You can also do this posture seated.